The African Americans: Many Rivers to Cross - Episode Three - Transcending the Black Hole (1881-1899) - who is nicka smith? 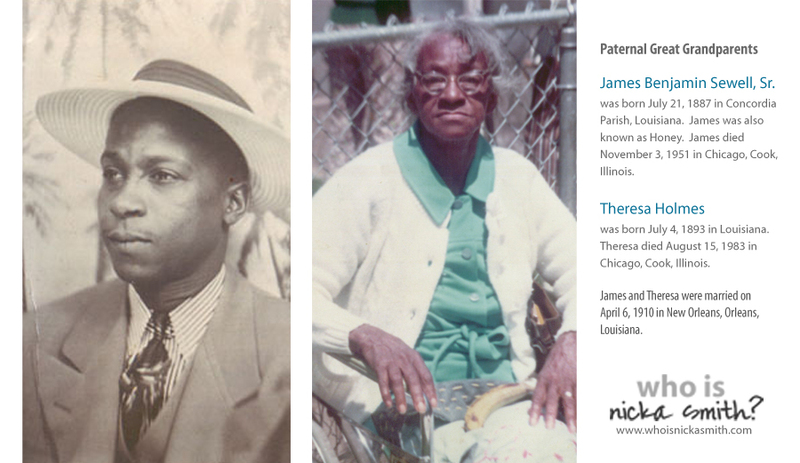 Two of my “Black Hole” ancestors, my paternal great grandparents. 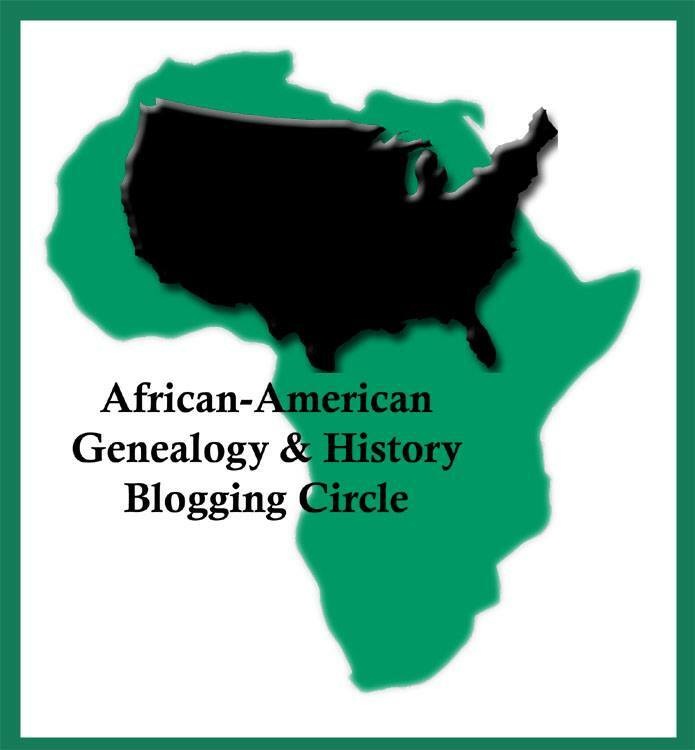 this period is often referred to with dread in the genealogy community because it’s the one where we don’t have access to a complete federal census (the 1890 US census was partially damaged by fire and then later mostly destroyed). it’s one of the only universal brick walls when it comes to all genealogy in the US, regardless of race. all of us have ancestors who took their first breath, continued taking breaths, or stopped taking breaths during these years. it’s true that census was darn important. on the other hand, when you rely so heavily on the federal census, and you don’t make an effort to look in other places for documents on those folks and in essence, you are giving up altogether on getting a full picture of them. think of it as getting a different color matting than you originally planned for that prized photograph or painting you own. The Black Hole is about our ancestors establishing themselves for the first time as people, not property. Books – Google Books, county histories – i often find that one of the most overlooked assets is the old ink to the page (or scanned book to digital image) when it comes to seasoned family historians and especially the newbies. is there a county/parish history written for where your ancestors were during The Black Hole? let’s take a step back…have you ever searched online for one or looked for it when visiting your ancestral home to do research? note: there is a possibility that African Americans may not be covered in the book in depth or at all. let’s just keep it all the way real about that. if that’s the case, you’ve got some work to do to establish a timeline for your ancestors by doing your own research about what was going on there during that era. did you know that FamilySearch offers a collection of scanned family history books from different libraries on their website for FREE?!? for Google Books, click here to read about how Congressional testimony unearthed the name of a former slaveholder during a discussion about voter suppression in Louisiana during Reconstruction. Conveyance Record – King Atlas, Jr. to US Senator Joseph Ransdell, Deed on December 30, 1899, Book U, Page 497, East Carroll Parish, LA. Property – Deed and Tax Records, land leases/sharecropping, labor/supply contracts – in my opinion, these records are one of the top three most valuable in this list. why? they often provide clues on relationships whether it’s with family members, close friends, businesspeople, or quite possibly even former slaveholders. what if your ancestor never owned land? if they owned a horse, mule, or etc., they had to pay a tax to help defray the cost of the Civil War once it concluded. 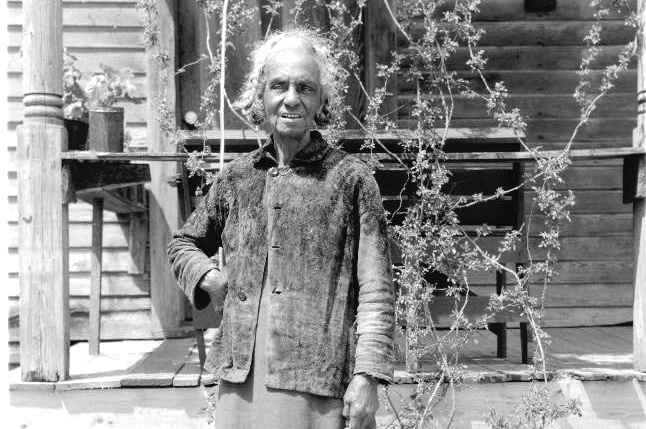 was your ancestor a sharecropper or subject to a land lease? did they need money for things to run their farm or for food and clothing for their family? if so, they may have entered into a supply contract with a local merchant and these types of things were almost always documented in records in the county/parish courthouse as a supply contract or a mortgage. in East Carroll Parish, the mortgages were kept in separate books than the conveyances/deeds up until the about the Depression. Voters Registrations and lists, miscellaneous lists or directories – as per the 15th Amendment to the US Constitution, African American men were given the right to vote in 1870. lists or rolls with the names of qualified voters in the county/parish were taken to denote who was eligible to vote. i’ve found these lists online (such as in Alabama), hidden in a back closet in the Registrar of Voters Office, on Google Books as a result of a dispute over an election…you just never know. while i’m aware that the links in these examples don’t fall into The Black Hole, who is to say that these records aren’t available for your ancestor in your particular area during that time period? furthermore, the area your ancestors were in may have other lists that they used for a particular purpose, such as a city directory. also, school records, such as the Mississippi Enumeration of Educable Children lists are equally as valuable and provide info on not only the child, their age, but the names of their parents too. 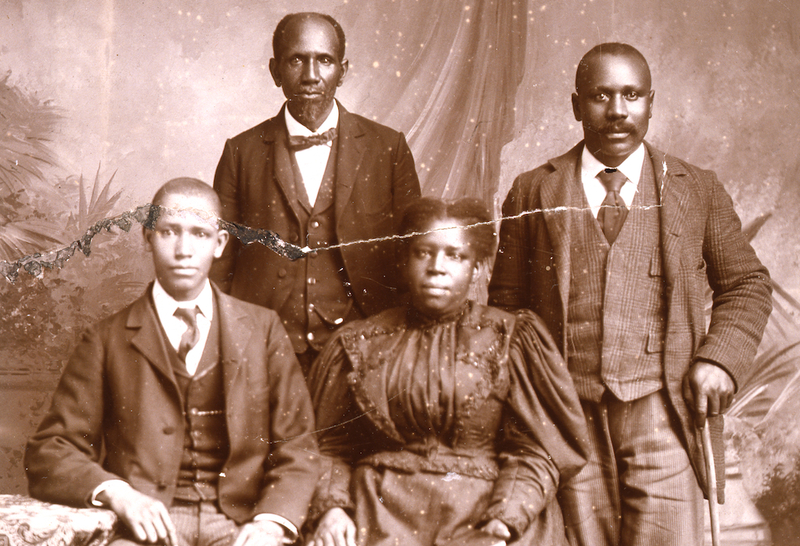 Personal Accounts – Slave Narratives, diaries, papers collections at universities – i’ve been shocked that i don’t recall a single piece from the Federal Writers Project Slave Narratives read during the series. it’s possible that i could have missed it, but i promise i don’t remember them even being mentioned at all. (perhaps it was a clearance issue, but aren’t those works not copyrighted since they were part of government work? i digress 🙂 lol) these narratives are direct from people who were former slaves and were documented during the Depression. have you searched for the city, town, or county/parish your ancestor lived in while reading the narratives? what did the former slave say about it? have you searched for a diary or a set of papers from a resident of the city, town, or county/parish your ancestor lived in at a local library, state archives, or university? what does their account say? was the area riddled by disease or natural disasters? what was the condition of the African Americans there based upon the opinion speaker or writer? 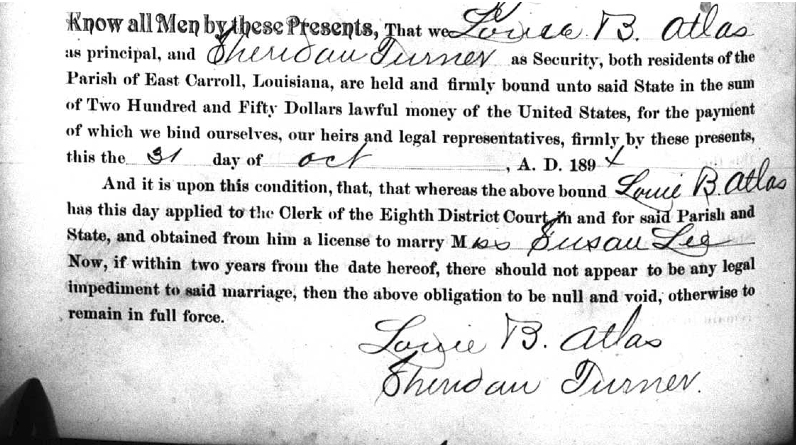 Marriage License of Louie B. Atlas and Susie Lee, married November 1, 1894 in East Carroll Parish, LA. Book F, Page 406. Noted above, both Atlas and his security are noted as being residents of East Carroll Parish, LA during 1894. 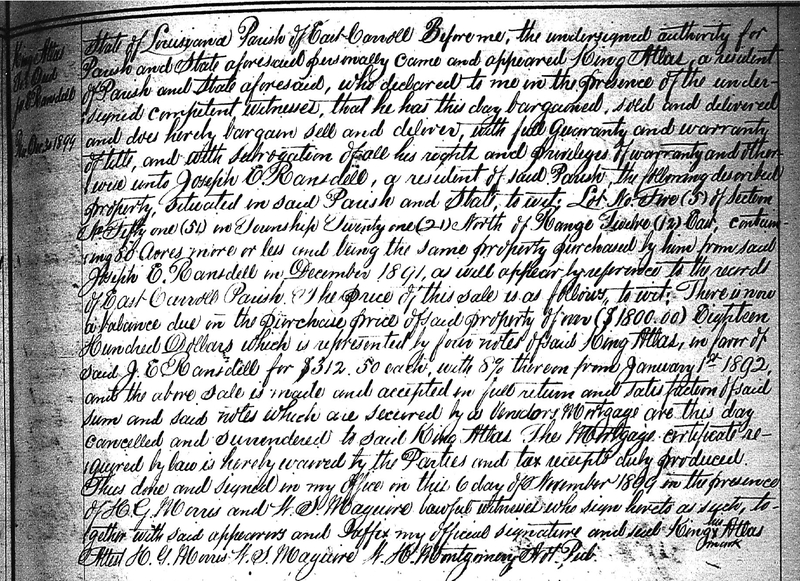 Birth Registers, Marriage Licenses, Death Certificates/Registers, Coroner’s Inquests, Burial Records – these are fairly obvious, but if your family lived in a rural area, like most of mine did, the only one of these things that existed for them were the marriage license and a possible Cororner’s Inquest record. a marriage license can provide the age of the applicant, their location at the time of marriage, witnesses who are family members or close friends (that you can add to your search list to help with establishing a timeline). if a cemetery or church kept great burial records, you can establish a timeline based on burial dates and information for an ancestor. Indian Chieftain – Vinitia, OK, September 24, 1885 – Page 1. Newspapers – this is definitely up there when it comes to the top 3 things on this list. newspapers are SO underutilized in genealogy research and i think that’s because the vast majority are not indexed or scanned and available online. this means sometimes searching microfilm for hours on end just to find one shred of information. if you’re lucky, one of your local newspapers may be digitized on a paid site (such as Ancestry or Newspapers.Com) OR the Library of Congress has included it in the Chronicling America collection online. at right, i found a notation of the death of my great grand aunt, who happened to also be my 2x great grandfather’s second wife. (yes, Ike Rogers was a complicated man. lol) OR you could find a library that has access to Proquest Historical Black Newspapers to get access to other papers online. Military – US Civil War Pension Files, WW1 draft cards – if you had an ancestor, family member, or close family friend who served in the US Civil War and collected a pension, search the pension cards and order a copy of the file from the National Archives. these files contain depositions from people who were familiar with the solidier and/or their dependents and are excellent to establish a timeline for people. now, i can hear someone fussing at me about listing the WW1 draft cards. lol yes, you can use these during The Black Hole. why? because registration happened as follows: first registration: men born between june 6, 1886 and june 5, 1896, second registration: men born between june 6, 1896 to june 5, 1897, and third registration: men born between september 11, 1872 to september 12, 1900. in addition to establishing where these men were born, it also establishes where their family was around their birth. Indian Territory – Dawes Commission Records and Tribal Rolls – a COMPLETELY overlooked area during episode 2 and 3 was the discussion of the former slaves of the Five Civilized Tribes. if you ancestors, like mine, were former slaves of one of those groups, and they, relatives, friends, and/or associates, lived to attempt to or successfully registered for the Dawes Commission, you can get some good info regarding Black Hole activities in a file. These records are available on Fold3.Com and are PRICELESS for someone who has ancestry in the Indian Territory since the first federal census there wasn’t until 1900. Other Census – State Census, 1900 federal census – if you’re lucky to have ancestors who lived in a state that had a state census, these are truly valuable during The Black Hole. the same thought process behind utilizing the WW1 draft cards applies to utilizing the 1900 Census; these establish where someone was born and also establishes where their family was around their birth. was there a big shift in location between the 1880 census and 1900 census? have you looked into why that may have happened? was there a major issue in the area your family was living? Church records – some churches have impeccable records. they can tell you when your ancestor was baptized, when they tithed, and when they made a remark during a meeting. we can’t always make an assumption that a church was disorganized and didn’t maintain these things. they’re out there. Municipality Recs – police jury, city council – have you thought about checking minutes from policy jury/board of supervisors meetings? what about the city council? they may have mentioned your ancestors or could provide some great clues as to what was happening. no more whining about The Black Hole! let’s find our peeps! other genealogists are contributing their commentary for each episode too. here are links to their commentary on episode three. Vicky Daviss-Mitchell – Many Rivers To Cross Episode 3: Oh Freedom!